From the simplicity of a peasant life in the Bavarian Forest, the Eisch family, through three generations, has grown into an important glass manufacturer. In 1914, Valentin Eisch, the founder of the Eisch glass factory, worked as a master engraver at the crystal glass factory of Counsellor of Commerce Isidor Gistl. In 1946 he started his own company together with his wife Therese, in order to build up a secure future for their six children. Their son Erwin Eisch was the pioneer and spiritual father of the studio glass movement in Europe. Since 1993, it has been the third generation of the Eisch family which has run the Eisch glass factory: Julia Eichinger-Eisch and Eberhard Eisch. Their website is www.eisch.de is one of Germany's most lauded glass manufacturers and has been named the “Glass Producer of the Year” by the German Retailers Association Fachkreis Hausrat/GPK more than any other glass producer. Over the last few years and even decades, wine glass research has primarily concentrated on finding a goblet shape which is constructed to optimise the characteristics of the wine. This has met with some considerable success, providing today's wine connoisseur with a great variety of different goblet shapes and sizes for enjoying exquisite wines. This continuing differentiation of glass design, not only with respect to the type of variety but also growing region, can be realised technically, but presents a consumer with a myriad of shapes and sizes to choose from hence complicating choice and is highly impractical. For more than 5 years Eisch glassware have pioneered how to impart an additional dimension to an “optimally” shaped wine glass for the benefit of wine enjoyment. The result of this research work is a new generation of goblets, the Sensis plus glasses. These glasses are made of high-quality, lead-free crystal. After the manufacturing process, the glasses undergo an additional treatment, which gives them their specific properties. Sensis plus glasses offer a completely new experience in the enjoyment of wine. 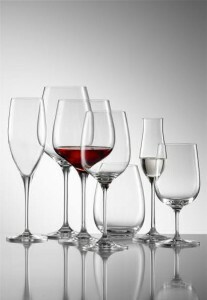 Wines poured into a these glasses become more harmonious and complex, with better balance and greater elegance. Through a completely natural process, the original character and structure of the wine are preserved, while its aromas and flavors become more expressive and generous. Sensis plus glasses also improve the enjoyment of spirits, fruit juices, sparkling water and other beverages.